This entry was posted on Friday, March 16th, 2012 at 2:00 am and is filed under 1950's, cdh, developing winfield. You can follow any responses to this entry through the RSS 2.0 feed. You can leave a response, or trackback from your own site. I was in Winfield TB Sanitarium in 1954 & at that time there were 75 beds. We women were on the second floor and the first floor was occupied by men. All rooms were semi-private with a bath shared by 2 rooms. Du Page County residents were treated free of charge as they had no public facility. However I was from Chicago so had to pay. This was a sister hospital of Michael Reese hospital in Chicago. My doctor was on the staff of Michael Reese so that is how I was admitted there. 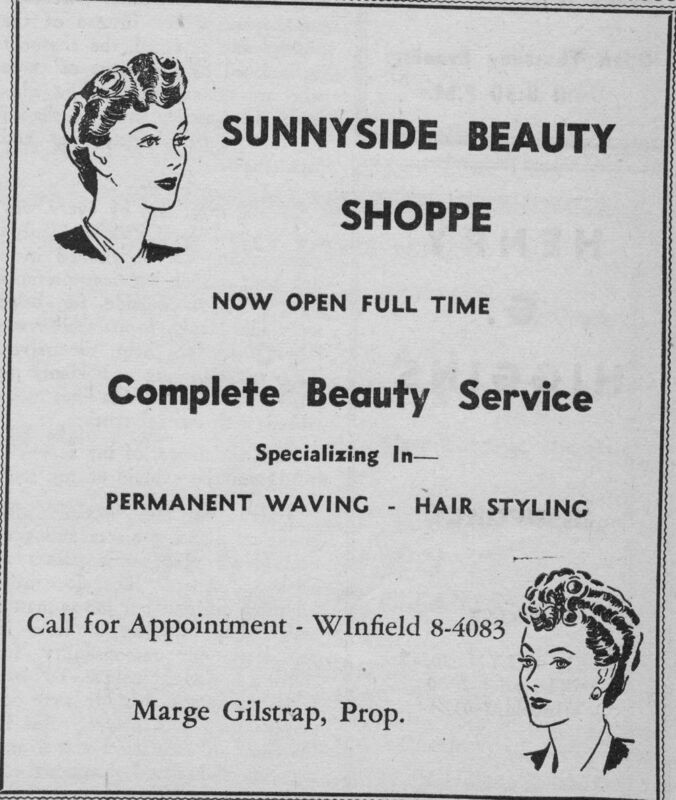 Winfield was an extremely modern facility in the 1950s & I was extremely fortunate to have been treated there. All the physicians were Jewish . However I was not. We were fluorscoped weekly which exposed us to a great deal od radiation. I also had pneumo-peritneum which collapsed my lung to rest it. This treatment is no longer used as it was dangerous unless the physician was very skilled. Even though I endured many outdated treatments that were unnecessary I did survive. I understand many other sanitariums did not offer the advantages we had nor the pleasant surroundings that Winfield offered. wow, thanks for this first person account…it definitely gives a more in depth look into what was going on at that original facility. Thank you for sharing and I wish you well. 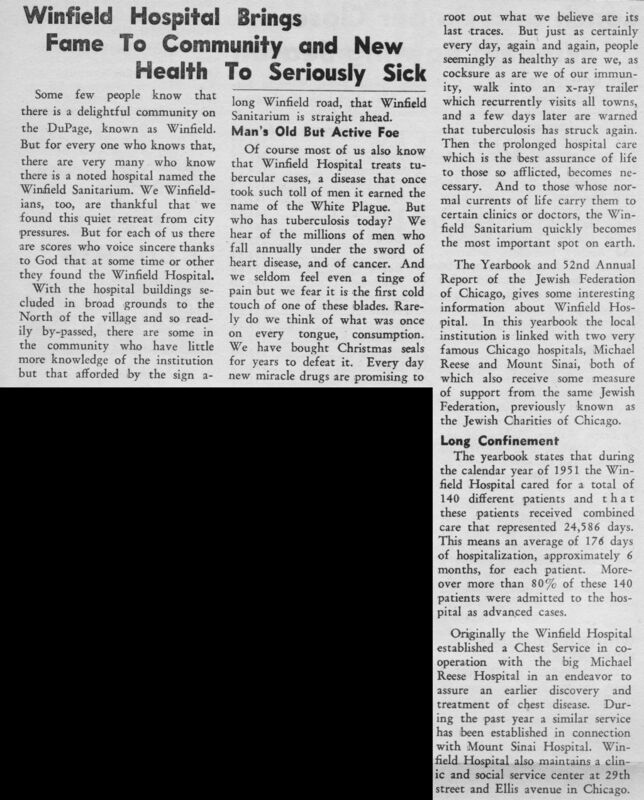 An entourage of 4 pulmonary physicians from Michael Reese plus house physician & nurse made the rounds once a week & decided if we were to be given more activity. There was also the dreaded chance if a surgery or other dreaded treatments. These doctors were extremely dedicated which helped our morals. I had very few visitors since I lived on the far southeast side of Chicago. There was also a real stigma to patients with t.b. Surgery was always done at Michael Reese; then patient returned to Winfield for a few months to recover. It was not an easy treatment but today .i M. 80 years old & never had a reaccurance of t.b. My mother, Hilde Freeman was also a patient at Winfield. She was there about a year. I was 6 years old when she got sick and about 7 when she returned home. She never, ever, talked about it. Her doctors name was Ed Levine. He was very kind and caring. We were not permitted to visit her, but i was once taken to the grounds and she was able to see my sister and I from a window. Once she was home from Winfield, she saw Dr Levine in his office in the Loop–I think it was on Wabash. She live to be 99 years old!